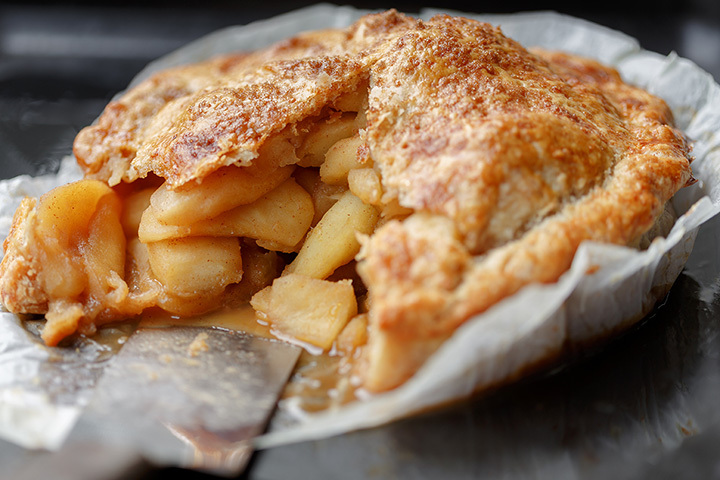 Did you know that the apple pie is Vermont’s official state pie? That means from Ludlow to Bennington to Woodstock, you’ll find an incredible variety of options for a delicious homemade apple pie. Whether you enjoy yours with a wedge of cheddar, a la mode, or straight up, these Vermont options offer only the best. Here are our favorites. Poorhouse Pies doesn’t have a fancy storefront, and you won’t find them carried at your local grocery store. In fact, you won’t find them at all, outside of a handful of Burlington area restaurants and small markets. However, these pies are hands down some of the best pies in Vermont. We are talking about handmade apple pies, nut pies, cream pies, seasonal pies, tarts, and shortcakes. This pie shop in the Okemo Valley not only serves delicious homemade pies, but they also serve breakfast. The upshot is that you can get buttermilk pancakes, Belgian waffles, omelets, and French Toast until noon to go with your slice of authentic Vermont apple pie. Of course, you can get homemade cheesecakes, sticky buns, and other tasty treats, too, but we’ll stick with the pie, thank you much. The Apple Barn is the retail arm of Southern Vermont Orchards, an orchard with roots that reach back all the way to 1910 and estate owned by a man named Edward Hamlin Everett, the inventor of a fruit jar that would eventually become the Ball and Mason jars. At his majestic home, he once owned 75,000 heritage apple trees, and, now, Southern Vermont Orchards owns what is left of his historic orchard, and they sell some of the best apple pies in the state. The Hartland Diner very much embodies the old Vermont saying, “you can’t get there from here,” and, though, it is accessible from Interstate 91, you may feel like you are lost in Vermont as you drive through the tiny town of Hartland. But, make no mistake, this is one food destination you don’t want to miss, as from-scratch breakfasts are served all day and the pies are all but famous. Cold Hollow has long been known in the Green Mountain State as the spot to go to get the best raw, unpasteurized sweet cider and cider donuts, but, in the past few years, they have also started making pies, namely apple pies. These homemade treats are hand crafted and baked freshly on the spot with Cold Hollow’s own MacIntosh apples and their special spice blend, and the pies are available at their store and online. Established in 2014, the Southern Pie Company quickly took Vermont by storm, offering such delicacies as sour cream pie, chocolate walnut pie, and the so-called best strawberry rhubarb pie in the county. Bringing a touch of the South to the Green Mountain State, owners Leslie and Scott Blair offer tradition and signature pies in the quaint Vermont town of Chester, and their apple pie is one of their best sellers. Established in 1994, Grandma Miller has been slinging pie dough in Southwestern Vermont for nearly two decades. The bakery in South Londonderry specializes in fruit pies and frozen mail order pies, and over 30 retailers in the local area carry these sweet treats. Of course, you’ll also find cakes, cookies, cream pies, pumpkin pie, pecan pies, and more, but our favorite is apple. Piecemeal Pies features British-inspired meat and veggie pies, like rabbit & bacon, chicken & leek, pork & parsnip, and more. Owner Justin Barrett is an architect-turned-pastry chef, and he had been serving these savory lunch and dinner options for more than five years. Now, much to the delight of citizens in Vermont’s Upper Valley, Barret has begun offering holiday pies like triple apple, mixed berry, pumpkin, and bourbon pecan. Of course, sometimes the best apple pie is your own apple pie, and, as it turns out, Vermont is full of Master Chef-worthy bakers and home pastry chefs just waiting to display their pie-making prowess for all to see. And, every year, on the Saturday after Columbus Day the Cabot School Gym the six-hour apple pie festival offers bakers the opportunity to do just that. Of course, you’ll full games, local entertainment, and crafts, but the apple pie is the real star. Mountain Creamery is basically your typical New England diner, and they serve breakfast all day and offer free refills on your coffee. The difference is that almost everything on their menu is made with ingredients from their nearby farm, Hinterland Organic Farm. So, whether you order eggs, beef, chicken, pork, homemade ice cream, or their from-scratch apple pies, you know your food, literally, comes from Vermont.